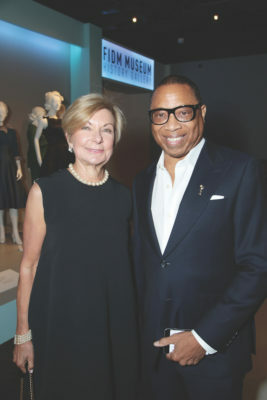 The Television Academy joined forces with the Fashion Institute of Design & Merchandising (FIDM) Museum to present the 12th annual exhibit of the “Art of Television Costume Design” Aug. 18. Some 600 very lucky guests, honorees and designers descended on the downtown grounds of the Institute for a first look at Emmy-nominated costumes from nine television shows that were included in the over 100 costumes from 24 shows on display. It was quite a salute to the designers in attendance, such as Cynthia Summers, Lou Eyrich, Rudy Mancle and Mona May. “Glow” actress Alison Brie struck the pose of her character’s mannequin and had a chuckle with the show’s designer, Beth Morgan. 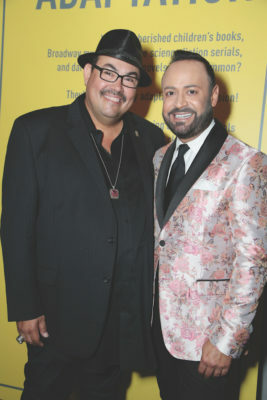 SALVADOR PEREZ, president of Costume Designers Guild, celebrates at FIDM with designer Nick Verreos. The opening gala continued outside the museum with a ceremony introducing Emmy nominees by Television Academy Chairman and CEO Hayma Washington. Others there among the glamorous and glorious, dining on an array of gourmet salads, artisan breads, chicken dishes and cocktails were Carlos Vasquez, Michelle Cole, Sohn Mishra, Hala Bahmet, Julie Weiss, Paul David and Nick Verreos, Allyson Fanger, Costume Design Guild’s president Salvador Perez and designer Allison Leach. The FIDM “gang,” Kevin Jones, Kristina Johnson, Peter Lam and Meg Hansen, showcased potential acquisitions from the court of Empress Josephine, one of many projects FIDM has curated and preserved. All that the Museum has to offer will be open to the public and free Tuesday through Saturday, 10 a.m. to 5 p.m. through Oct. 6. FOR TARFEST 2018, City Controller Ron Galperin offers his salute at the annual Greater Miracle Mile Chamber of Commerce luncheon preceding the event. At the center table at left are other speakers: LACMA CEO and Wallis Annenberg Director Michael Govan, Los Angeles County Arts Commission Executive Director Kristin Sakoda and Fourth District Councilmember David Ryu. Between Sakoda and Ryu are Chamber president Steve Kramer and his wife, Wendy. At Govan’s right and obscured is Miracle Mile leader Wally Marks, then Craft and Folk Art Museum (CAFAM) Executive Director Suzanne Isken and her husband Eric. Isken received surprise proclamations for her and CAFAM’s good works. “We just celebrated the 10th anniversary of Chris Burden’s iconic ‘Urban Light’ installation. 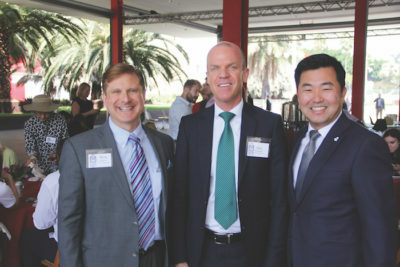 He said he messed up his speech — he left out that he wanted to put the miracle back in Miracle Mile,” said LACMA’s Michael Govan when, on Sept. 12, the Greater Miracle Mile Chamber of Commerce gathered members, local politicians, business officials and guests at LACMA’s Smidt Welcome Plaza for the annual Tarfest Luncheon. ROB FISHER and Kristin Sakoda at Tarfest Luncheon. Tarfest, the oldest and largest free music and arts festival in Miracle Mile, celebrated its 16th year when it returned Sept. 22. 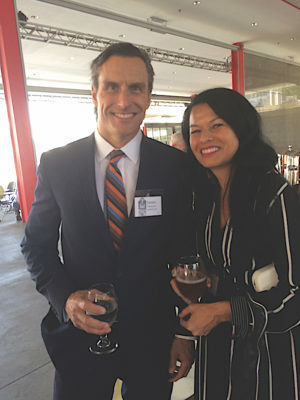 At the preview luncheon, Mr. Govan introduced the new executive director of the Los Angeles County Arts Commission, Kristin Sakoda. “One out of every seven jobs in our area goes to the creative economy, and LACMA attendance has doubled in the past year,” she noted. JAMES PANOZZO and Merry Karnowsky at Tarfest Luncheon. 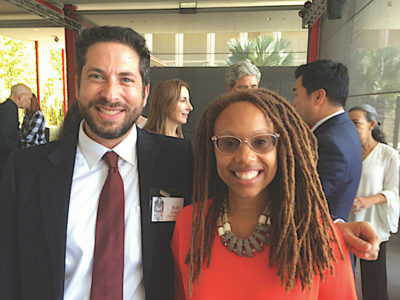 “We are building the community through the arts,” said Launch LA and Tarfest founder James Panozzo as he thanked sponsors Olympia Medical Center’s Matt Williams and The Grove’s Ryan Hawley, among others, including Los Angeles Metro, the Petersen Museum and the Japan Foundation. In a surprise to her, the Craft and Folk Arts Museum’s long-serving Director Suzanne Isken was honored. “We are small, but mighty,” she said as she accepted proclamations. CITY Controller Ron Galperin, Olympia Medical Center CEO Matt Williams and Councilmember David Ryu at Chamber lunch. Greater Miracle Mile Chamber of Commerce president Stephen Kramer presided along with GMMCC executive director Meg McComb. Others enjoying cuisine from the Black Dog Café were 4th District Councilman David Ryu, Mr. Ryu’s area deputy Rob Fisher, Deputy Chief of Staff Estevan Montemayor, communications deputy Mark Pampanin, City Controller Ron Galperin, Wally Marks, Joyce Kleinfeld, Mindy Lake, Lyn Cohen, Merry Karnowsky, Dawn McDivitt, Wendy Kramer, Tag Gallery’s Karen Sarrow, Hotel Wilshire’s Andrew Garcia, Susan Paulos, Pam Rudy, Jane Gilman and Roz Hargrove. We have some very generous establishments in our ’hood! « Hoedown and pumpkins on Blvd.